Effects of silver nanoparticles on stress biomarkers of Channa striatus: immuno-protective or toxic? Nanotechnology is a novel arena with promising applications in the field of medicine, industry, and agriculture including fisheries. Cross-disciplinary interactions and the application of this technology in biological systems have led to the innovation of novel nanoparticle antioxidants, which are the subject of our study. In context with above background, we designed an experiment on nano-silver to elucidate its role for mitigation of abiotic and biotic stress. Three diets were formulated viz. silver nanoparticles (Ag-NPs) incorporated at 0.5 and 1 mg/kg diet and control diet (Ag-NPs at 0 mg/kg). 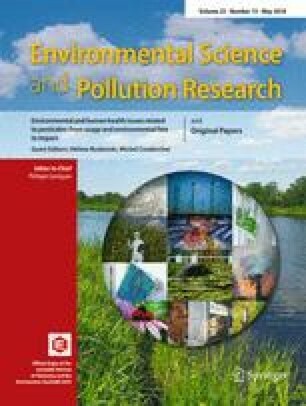 Fish were exposed to sublethal level of 1/25th of LC50 (4 ppm) of lead (Pb) and temperature at 34 °C. The effect of Ag-NPs on productive performance (weight gain %, feed conversion ratio, protein efficiency ratio, and specific growth rate), stress biomarkers (catalase, super oxide dismutase, glutathione-s-transferase, acetylcholine esterase, cortisol, heat shock protein), biochemical and immunological response (protein and carbohydrate metabolic enzymes, phagocytic activity, serum total protein and albumin: globulin ratio), histopathology alterations in the liver and gill as well as survival of Channa striatus, following challenge with pathogenic bacteria were evaluated. Dietary Ag-NPs at 0.5-mg supplementation improved growth performance, immunity, survival, and reduced stress biomarker such as HSP 70, cortisol, and blood glucose in various fish tissues. Exposure to Pb and high temperature and group fed with Ag-NPs (1 mg/kg diet) demonstrated remarkable changes in the histo-architect of liver such as pyknotic nuclei, pyknosis, leucocyte infiltration, hemorrhage and karyokinesis, blood vessels with nucleated, lipid vacuoles in the liver tissue. Histology of gill displayed hyperplasia, aneurism, blood congestion, severe telengiectiasis, epithelial lifting, curling of secondary lamella, hyperplasia of epithelial cell of secondary lamella in the group exposed to lead and high temperature and supplemented with Ag-NPs at 1 mg/kg diet. In addition to histopathology, feeding with Ag-NPs at 1 mg/kg diet deteriorated and altered all studied parameters including reduced growth performance. Results obtained in the present study suggest that supplementation of Ag-NPs at 0.5 mg/kg diet has a definitive role to play in the mitigation of abiotic and biotic stress in C. striatus. Authors express sincere gratitude to the Director, ICAR-National Institute of abiotic Stress Management, Baramati, Pune for providing all the facilities to conduct the present work. The financial assistance has been provided by Indian Council of Agricultural Research (ICAR), New Delhi, India as institutional project (#IXX09651) is highly acknowledged. I also place a record of thanks to Mrs. Yogita and Mr. Yuvraj Sanas for their technical assistance.